This year has been extremely busy and exciting for the Hawkins Chamber of Commerce and the Hawkins Incubator. One of our contest winners from the competition held for entrepreneurship has finally opened. Bizzie Lizzie's Coffee Shoppe opened on September 10, at 7:00. Elizabeth Anderson (Bizzie Lizzie) opened her doors (and drive through window) to those sleepy eyed families looking for an early morning pick-me-up, as they dropped of kids for school or those early morning commuters needing a cup of joe as they travel the quiet streets on their way to work, as others make their way in to savor in the smells of coffee brewing and catch up on local happenings within the community. The Chamber building offers seating for those who just want to come in and relax, or gather with other like-minded individuals and chit-chat the day away or play a board game while contemplating the day away. 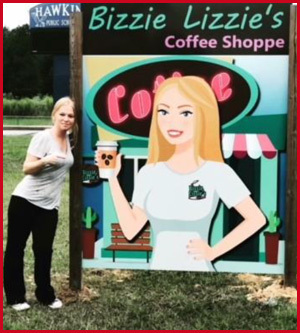 Bizzie Lizzie's Coffee Shoppe is your one stop that will get you on your way in the morning. We look forward to meeting each and every one of you. Chamber of Commerce Websites provided by Finding GodsWay Web Ministries, Inc., all rights reserved.